The Agudas Achim synagogue in Brno, the Czech Republic’s second largest city commissioned Mark Podwal to create a new parochet. You can see a photo here. The recent parochet dedication was filmed by two Czech Television stations. Currently Podwal is designing seven more textiles for that synagogue. 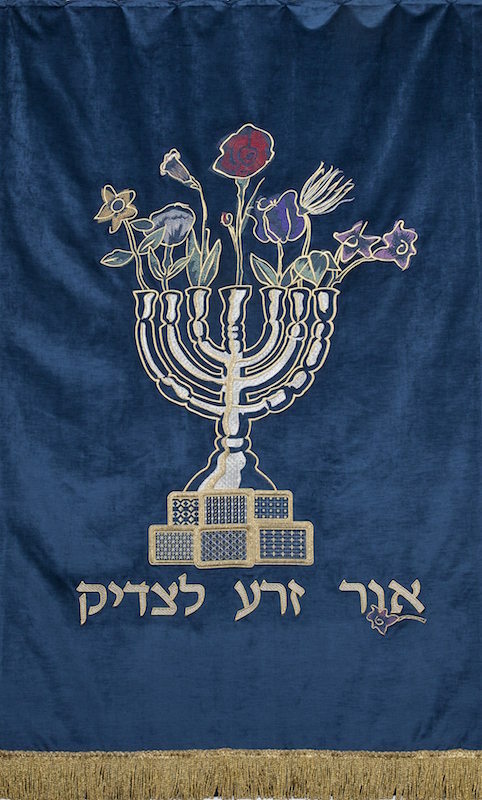 He is well known for his textiles for the AltNeuschul in Prague, which were exhibited at New York’s Yeshiva University Museum before shipping to the Czech Republic. See images here. The Agudas Achim synagogue in Brno, built in the 1930s, is an example of modern functionalistic architecture. During World War II, the synagogue was used as a warehouse, which resulted in considerable damage. After the war, it was reconsecrated but the property had not gone through any major structural modifications and fell into disrepair. In 2014 a major restoration project’s objective was to return the interior to its original condition. The renewed synagogue will serve not only its religious purposes – it will be open for the general public as well. Cultural events, concerts, exhibitions and educational workshops will focus on the regional Jewish legacy. Mark Podwal was commissioned to design all of the synagogue’s new textiles.